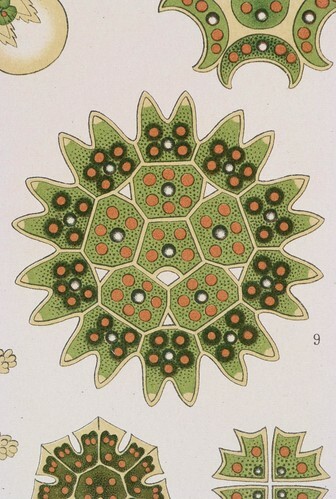 Melethallia (detail), Ernst Haeckel, Kunstformen der Natur. Chromolithograph 32 x 40 cm, Verlag des Bibliographischen Instituts, Leipzig 1899-1904. Photograph by D Dunlop. WikiMechanics uses a finite categorical scheme of binary distinctions to describe sensation. So the number of sub-orbital events $N$ may be large but not infinite. This requirement can be relaxed later to make a continuous approximation, thereby allowing the use of calculus. But in principle $N$ is finite and accordingly changes in $\theta$ may be small but not infinitesimal. For isolated particles the increment in the phase angle does not vary and so there is an equipartition of $\theta$ between sub-orbital events regardless of their quark content. Next step: Zooming in on space.